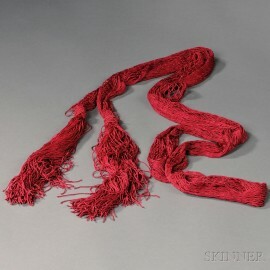 American Officer's Sash, c. early 19th century, crimson sash woven in a fishnet style, with macrame-style knot slides on each fringed end, fringe lg. 9 in., overall lg. 9 ft.
Provenance: From the collection of W. Scott Ferriss. Nice vibrant color, with a few snags in weaving.